Front With A, cast on 15 stitches. Row 1 (RS) Using A, knit. Row 3: Using B, k4, slip 1 purlwise, k5, slip 1 purlwise, k4. Row 4: k4, yarn forward (yf), slip 1 purlwise, yarn back (yb), k5, yf, slip 1 purlwise, yb, k4. Row 5: p4, yb, slip 1 purlwise, yf, p5, yb, slip 1 purlwise, yf, p4. Row 6: Repeat row 4. Cut B. Row 7: Using A, knit. Row 9: k1, slip 1 purlwise, (k5, slip 1 purlwise) twice, k1. Row 10: k1, yf, slip 1 purlwise, yb, (k5, yf, slip 1 purlwise, yb) twice, k1. Row 11: p1, yb, slip 1 purlwise, yf, (p5, yb, slip 1 purlwise, yf) twice, p1. Rows 15-18: Using A, repeat Rows 3-6. Row 19: Using A, knit. Back, Please Note: The back of the pouch is exactly the same as the front, except you use yarn B in the last repeat of the pattern instead of in the first repeat. This way, when you fold the piece to form a pouch, the stripes of yarn B will line up. Obviously, you are free to mix up the colors the way you want to! Then, using A, repeat rows 3-6. Using yarn B, repeat rows 15-18. 1. When picking up stitches, insert your needle through 1 stitch on both the front and back edges of the pouch, to join them. (This is similar to working a three-needle bindoff.) 2. Pick up and knit 2 stitches, *bind off 1 stitch, pick up and knit 1 stitch, repeat from * until you have completed the side seam. 3. On the side of the pouch where you are going to attach the cord, leave the last stitch live, and start fingerknitting the cord from this stitch. On the side of the pouch where you are not going to attach the cord, simply fasten off this last stitch by cutting the yarn and pulling the tail through the stitch. Butterfly Stitch, the 2-color cord, is a variation of the beloved children’s pastime of finger knitting, which is nothing more than making a slip knot and then pulling a loop through that loop and each succeeding loop to form a chain. 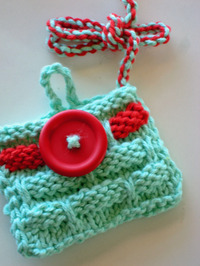 Using the live stitch (Color A) as your starting point, pull a loop of Color B through the live stitch. Now, keeping Color A and Color B from crossing as you work, alternate pulling one color through the last loop of the other color. Each time you pull a new loop through, you must tug on the old loop to snug it up. If you are careful not to cross the yarns as you work, and if you tug with an even tension, you will get a nice round cord that is free of twists and knots. When the cord is the desired length, cut the yarns, leaving a 2-inch tail, and tie the tails with snug square knots to secure. (Now would be a good time for a tassel.) Sew or weave in all the ends on the inside of the pouch. Kay Gardiner is co-author, with Ann Shayne, of Mason-Dixon Knitting: The Curious Knitters' Guide and a second Mason-Dixon Knitting book scheduled for publication in 2008. That first book grew out of their blog, www.masondixonknitting.com , famous for linking norhern and southern sensibilities (and sense of humor). 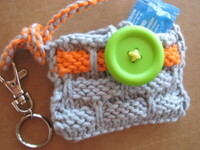 Kay's "Ballband Condom Amulet" is based on one of their favorite patterns [page 19] for a knitted washcloth.